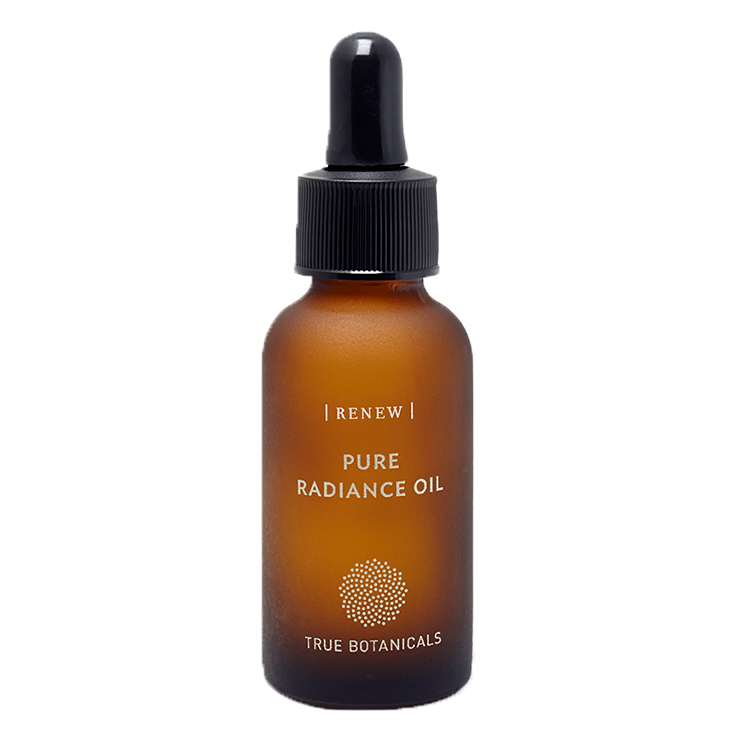 Get in on the goodness of facial oils with True Botanicals Renew Pure Radiance Oil. Designed to take the place of traditional facial moisturizer lotions and creams, this oil blend of chia and kiwi seed oils gives skin a feeling of supreme moisture and protection. Passion fruit and papaya seed oils make skin feel ultra conditioned and smooth, boosting a look of clarity and refinement. Algae extract improves the appearance of healthy, plumped skin. Marula oil reduces signs of redness and red raspberry seed oil lends a sense of protection against sun damage and aging. The complexion is left looking radiant and youthful. Apply 2-10 drops to clean, slightly damp skin, and gently press onto skin. Follow up with sunscreen for daytime, and a serum for nighttime use. Camellia Oleifera (Tea) Seed Oil*, Vitus Viniferi (Grape) Seed Oil*, Persea Gratissima (Avocado) Oil*, Sclerocarya Birrea (Marula) Seed Oil, Cannabis Sativa (Hemp) Seed Oil*, Salvia Hispanica (Chia) Seed Oil*, Borago Officinalis (Borage) Seed Oil*, Citrullus Lanatus (Watermelon) Seed Oil, Rosa Rubignosa (Rosehip) Seed Oil*, Rubus Idaeus (Red Raspberry) Seed Oil, Argania Spinosa (Argan) Kernel Oil*, Oenotherus Biennis (Evening Primrose) Oil*, Squalene (From Olives), Tocopherol (Non-GMO Vitamin E), Actinidia Deliciosa (Kiwi) Seed Oil, Carica Papaya (Papaya) Seed Oil, Passiflora Incarnata (Passion Fruit) Seed Oil, Silybum Marianum (Milk Thistle) Seed Oil, Algae Extract, Haematococcus Pluvialis (Astaxanthin From Red Pond Algae) Extract, Rosmarinus Officinalis (Rosemary) Leaf Extract*, Pinus Densiflora (Red Pine Needle) Oil, Abies Sibirica (Fir Needle) Oil, Cinnamomum Camphora Linalooliferum (Howood) Wood Oil, Jasminum Officinale (Jasmine) Oil, Citrus Aurantium Amara (Neroli) Leaf/Twig Extract, Boswellia Carterii (Frankincense) Oil, Rose Essence, Rosa Damascena (Rose) Flower Oil, Vetiver Oil.